Delayed significantly because of the death of its star, a full decade elapsed between the time Steven Spielberg bought the movie rights to a children’s book about an ornery green ogre and the day Shrek showed up in movie theaters. The Dreamworks project went from doomed to successful when the anti-fairy tale fairy tale became popular enough to spawn three sequels and a spin-off prequel, and critically acclaimed enough to become the first ever recipient of the Best Animated Feature Oscar. Here are 15 things you might not know about Shrek. 1. IT WAS WRITTEN BY AN 83-YEAR-OLD. Shrek was loosely based on William Steig’s 1990 picture book, Shrek! Steig was a prolific cartoonist for The New Yorker and a children’s writer who Newsweek once dubbed the “king of cartoons.” Steig passed away at the age of 95 in 2003, two years after Shrek's release. 2. STEVEN SPIELBERG WANTED BILL MURRAY AND STEVE MARTIN TO PLAY SHREK AND DONKEY. The mogul bought the rights to the book in 1991, picturing Shrek as a standard hand-drawn animated film for his Amblin Entertainment company with the two comedians in mind in the lead roles. He couldn’t get the project off the ground until years later though—after Dreamworks SKG, the studio he ran with Jeffrey Katzenberg and David Geffen, came to be in 1994. 3. THE PRODUCER’S KIDS ARE WHAT FINALLY GOT SHREK A GREEN LIGHT. John H. Williams’ tykes, a kindergartner and a pre-schooler, brought Shrek! to their producer father’s attention. The two children loved the book and read it multiple times. Williams brought it to Katzenberg, and the project finally got off the ground from there. 4. CHRIS FARLEY WAS THE ORIGINAL SHREK. Farley was not only cast in the title role, but he had actually completed recording somewhere between 80 to 95 percent of his dialogue before he passed away in 1997. In the version of the film Farley worked on, Shrek was a teenage ogre who didn’t want to go into the family business and had aspirations of becoming a knight. 5. NICOLAS CAGE TURNED DOWN THE LEAD ROLE BECAUSE HE DIDN’T WANT TO BE AN OGRE. Dreamworks executives considered Tom Cruise and Leonard DiCaprio for Shrek, until Katzenberg offered Nicolas Cage the part. Cage told the Daily Mail that he turned the role down because "I just didn't want to look like an ogre." Though, upon reflection, Cage realized that "Maybe I should have done it looking back." 6. MIKE MYERS DECIDED TO DO SHREK IN A SCOTTISH ACCENT AFTER SEEING A ROUGH CUT. After first trying an SNL “Lothar of the Hill People” voice and a thick Canadian accent, Myers finally settled on the now distinct Scottish intonation. According to Katzenberg, the studio spent an additional $4 million to start all over again doing it Myers’ way. The star disputed that it was really that much of an added expense. 7. NOBODY TOLD MYERS THAT HE WAS REPLACING CHRIS FARLEY. He said that he guessed correctly early in the process by just looking at a maquette of Shrek modeled on his former SNL co-star's physique, but nobody would confirm the truth to him. Myers didn’t find out until 2012. 8. JANEANE GAROFALO WAS THE ORIGINAL PRINCESS FIONA. But she was fired from the project, and the comedian-actress still does not know why. A report stated that she was initially hired because her sarcasm would balance out Farley’s positivity, and with the change in the casting of Shrek, Fiona’s part needed to change as well. 9. DONKEY WAS MODELED AFTER A REAL MINIATURE DONKEY IN PALO ALTO, CALIFORNIA. Pericles, a.k.a. “Perry,” was born in 1994 and is from Barron Park, near the home of Dreamworks. His companion is Miner Forty-Niner, a.k.a. “Niner”, who is considered a donkey of “normal” size. 10. THE MOVIE WAS SUPPOSED TO LOOK MUCH DIFFERENT. Shrek was conceived to be a live-action/CG animation hybrid, but a test screening for studio executives in the middle of 1997 was deemed unsatisfactory. Dreamworks’ production partners, PDI (Pacific Data Images), were then tasked with making the animation for all of Shrek’s 31 sequences, with 1,288 shots in each sequence, and 36 different locations. 11. THE FILMMAKERS WENT ABOVE AND BEYOND THE CALL OF DUTY. Some members of the movie's development team took mud showers to study the movement of mud. Art director Douglas Rogers visited a magnolia plantation for research—and was chased away by an alligator. 12. THE MOVIE WAS SCREENED BY DREAMWORKS AND DISNEY LAWYERS TO AVOID POSSIBLE LAWSUITS. 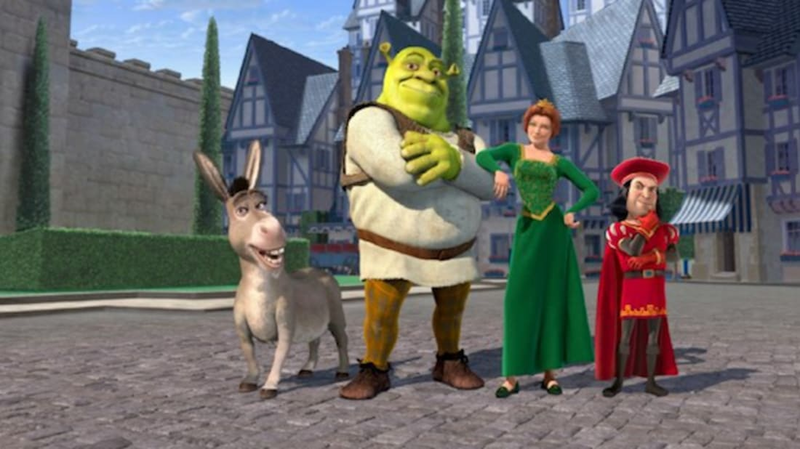 Shrek was considered by some to be a series of jabs at Disney, with its general cynicism toward the traditional fairy tales that Disney had presented in movie form since 1937, Farquaad’s castle resembling Disneyland, and Farquaad’s diminutive stature possibly a reference to an infamous quote by Katzenberg’s former Disney boss Michael Eisner about his hatred of the former employee in a lawsuit. While there was no legal action, some Radio Disney affiliates did not allow Dreamworks to buy ad time to promote Shrek. 13. JOHN LITHGOW BROKE A PERSONAL RULE WHEN HE AGREED TO PLAY FARQUAAD. The 6’4” actor always said he would never play anyone short, but he couldn’t pass up the Shrek role. He believed that part of the joke of his casting was the difference between his height and his character’s. 14. THE GINGERBREAD MAN CO-DIRECTED THE SEQUEL. Conrad Vernon was a storyboard artist in the original, and directed Shrek 2 with Andrew Adamson and Kelly Asbury. When Vernon refused to direct the third film because directing the sequel took up too much time and his efforts, the voice of the Magic Mirror, Chris Miller, co-directed Shrek the Third. 15. THE MOVIE SAVED DREAMWORKS. In 2007, Katzenberg said that Shrek not only saved the company financially speaking, but that it gave Dreamworks Animation an image that allowed them to make the Madagascar, Kung Fu Panda, and How to Train Your Dragon franchises.